Designed for live sound reinforcement, live recording, and studio recording applications, the PreSonus StudioLive 32SC is a Series III S 32-channel digital console, recorder, and audio interface in a subcompact, rack-mountable frame. The mixer features an integrated hardware and software system with a full-color touchscreen, 17 touch-sensitive, motorized faders, and 16 recallable XMAX preamps. The powerful dual-core FLEX DSP engine supercharges the mixer with Fat Channel vintage-style EQs and compressors on every channel, plus a four-slot FLEX FX processor that can run heralded digital reverbs and delays. Streamline your workflow with recallable scene presets, virtual sound check, and the supplied software library, which empowers you with remote control from a computer or iPad, remote monitor mixing using a mobile device, and all the software you need to track, edit, mix, and distribute your music. The StudioLive 32SC boasts eight XLR mic inputs and eight mic/line inputs via XLR-1/4" combo jacks. Additional inputs include four 1/4" aux inputs and a dedicated XLR talkback mic input with phantom power. The mixer provides a balanced XLR mono output, stereo XLR main outputs, 10 analog FlexMix outputs (six XLR, four 1/4" TRS), a pair of 1/4" monitor outputs, and a 1/4" headphone port. A digital AES/EBU output of the main mix is available via a rear-panel XLR socket. Additionally, unbalanced stereo RCA tape inputs and outputs are on hand to hookup a house music source and a separate stereo recorder. Record 32 channels and the main stereo mix to a Class 10 U3 SD card (available separately) via the onboard 34-track SD recorder, or stream 128 channels (64 in each direction) over USB 2.0 to and from your computer. You can even record redundantly to an SD card and a USB host computer at the same time. 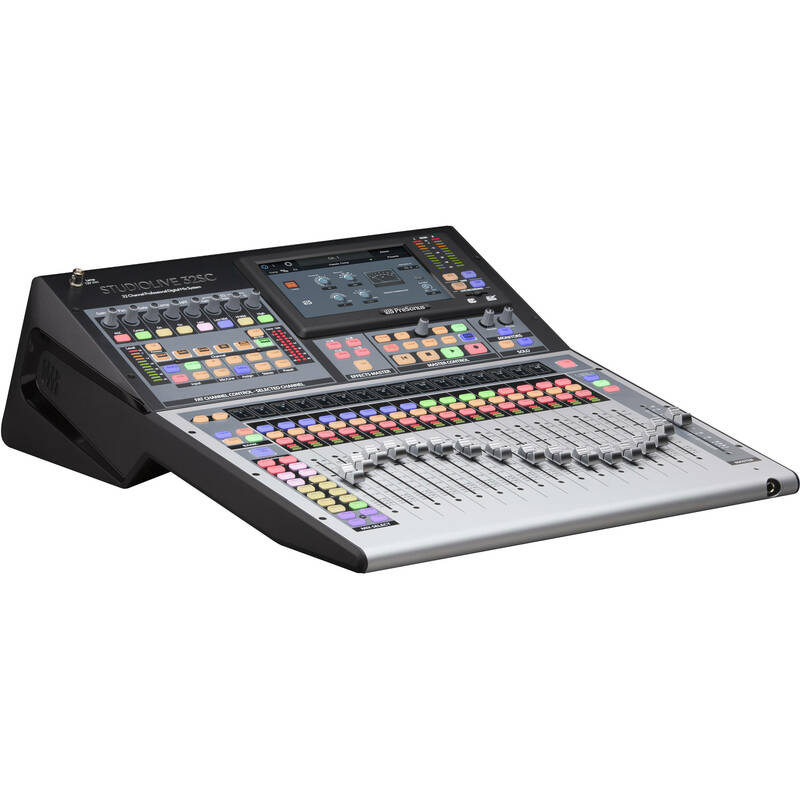 Take advantage of the StudioLive 32SC's built-in AVB networking capabilities for flexible system expansion, digital patching between networked devices, and more.